Born in County Wexford, Ireland, in 1745, John Barry was appointed a Captain in the Continental Navy December 7, 1775. He commanded LEXINGTON and ALLIANCE during the Revolutionary War. He was seriously wounded May 29, 1781, while in command of ALLIANCE during her capture of the British ships HMS ATLANTA and HMS TRESPASSY. Appointed Senior Captain upon the establishment of the US Navy subsequent to the ratification of the US Constitution in 1788, Captain Barry commanded the frigate UNITED STATES in the Quasi-War with France. Commodore Barry died on September 13, 1803, at Strawberry Hill near Philidelphia, PA. He was buried in St. Mary's Cemetery in Philidelphia, PA. Commodore Barry was honored by the United States Congress in 1906, when a statue was commissioned and later placed in Lafayette Park, Washington, D.C., and honored again some fifty years later when President Eisenhower ordered a statue of Commodore Barry to be presented on behalf of the people of the United States to the people of Ireland at County Wexford, Ireland. On August 21, 1981, President Ronald Reagan designated September 13, 1981 as Commodore John Barry Day, a tribute to one of the earliest and greatest American Patriots. Three other ships have been named in honor of this naval hero. 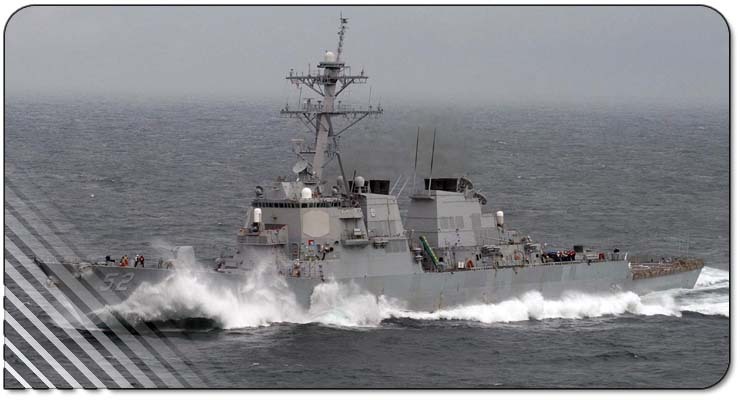 BARRY, the fourth ship in the United States Navy named after Captain Barry, is the second in the ARLEIGH BURKE - class of AEGIS guided missile destroyers and the first built by Ingalls Shipbuilding of Pascagoula, Mississippi. Her construction began on March 13, 1989; she was launched on May 10, 1991, and christened on June 8, 1991 by her sponsor, Mrs. Rose Cochran, wife of United States Senator Thad Cochran. Assigned to the USS GEORGE WASHINGTON (CVN 73) Joint Task Group, BARRY's first operational deployment was to Haiti for Operation Support Democracy in 1994. Later in 1994, BARRY commenced her first Mediterranean Sea deployment and returned to Norfolk, Va., in 1995. USS BARRY's most recent Mediterranean Sea deployment was from February 2000 to August 2000. This time, the destroyer was part of the USS EISENHOWER (CVN 69) Battle Group. Following the terrorist attacks in New York City and Washington, DC., on September 11, 2001, the commanding officer and the crew of USS BARRY requested the flag of the FDNY to be flown as battle ensign on their ship to commemorate the heroic work of the firemen in New York City. The Shield Red, white, and blue are our national colors. The field of bars, adapted from the BARRY coat of arms, is a reference to Captain John Barry for whom the ship is named. The stars recall the four battle stars awarded to the second BARRY in World War II, and represent all four ships to bear the name BARRY. The wavy pile represents the US Navy fleet in which Captain Barry held the first commission. The lion simbolizes courage and strength. Gold stands for excellence; red and white for courage and integrity respectfully. 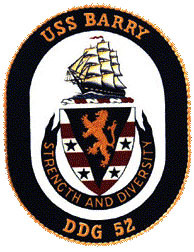 The Crest The frigate UNITED STATES symbolizes the unbroken tradition of patriotism, valor, fidelity, and ability from our Navy's beginning to the present, and represents the maritime imperative of our Country. It also honors the heritage of the three previous ships to bear the name BARRY. The stars and bars together symbolize the United States and refer further to Captain Barry's ship of that name.